Music and lyrics by Donovan P. Leitch, based on the Robert Burns poem Ye Banks and Braes o' Bonnie Doon. · Donovan: vocals and piano. 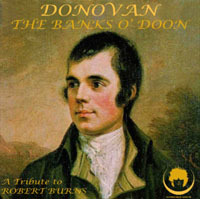 · Donovan recorded this song with lyrics based on the poem Ye Banks and Braes o' Bonnie Doon, by Scottish poet Robert Burns. This single coincided with the 250th anniversary of Robert Burns and joined the fight against ScottishPower plans to divert river Doon away from Ayrshire. Environmentalists associations claimed that this proposal would be an ecological disaster for the river, destroying salmon stocks and other marine life. Donovan was shocked when he learned about this: «here was a beautiful, iconic river under threat. All rivers are important, but this one is more important to me because of its connection to Robert Burns». Many of Burns' poems are inspired in river Doon. Besides, Donovan spent childhood holidays in Ayr. · This song was released to download only from iTunes.